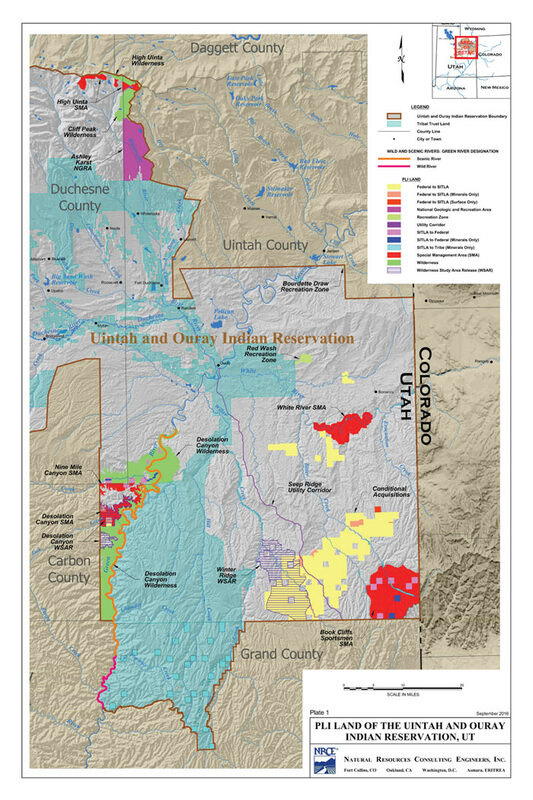 The Ute Indian Tribe of the Uintah and Ouray reservation is located in Northeastern Utah (Fort Duchesne) about 150 miles east of Salt Lake City, Utah. The reservation is in a three-county area, known as the Uintah Basin. The reservation is the second largest Indian Reservation in the U.S. and covers over 4.5 million acres. They have a membership of 2,070, and over half of the members live on the reservation. Three bands of Utes make up the Northern Ute tribe: the Whiteriver, Uncompahgre, and Uintah. The Uintah Band was first to call the Uintah Basin their home. Later, the Whiteriver and Uncompahgre bands were removed from Colorado to the Uintah Valley Reservation, creating the Uintah and Ouray Reservation. According to Ute tradition they were brought here by the god Sinauf. Anthropologists say that the Utes migrated to the northern Colorado Plateau between one and two thousand years ago. They are part of the Southern Numic speakers of the Numic language family. They are talented artists, specifically creating religious and ceremonial beadwork and leatherwork. The Utes lived in bands in a gathering and hunting economy, and with the introduction of horses in the 1600s they were able to travel farther and quicker. Their way of life was disrupted as contact with the Spanish began, who brought the slave trade and who increased tribal conflicts. Further problems developed with the arrival of Mormon settlers, who expanded into Ute land and competed for their natural resources. After conflicts with the Mormons, the Utes signed the Treaty of Spanish Fork in 1865 and were forced to move to the dry Uintah Basin. In 1881, the U.S. government forced the White River Utes from Colorado to the Uintah Reservation, and the following year they created the Ouray Reservation next to it, later consolidating them. By 1933, 91% of their reservation lands had been taken due to allotment. This made their traditional way of life impossible. Farming proved unsuccessful, so the Utes turned to raising sheep, cattle, and horses. In the 1950s the Utes won multiple legal battles and received $32 million in reparations for their land losses. Today they have many businesses, continue to raise cattle, and mine oil and natural gas.